A tattoo machine is a hand-held device generally used to create a tattoo, a permanent marking of the skin with indelible ink. Modern tattoo machines use electromagnetic coils to move an armature bar up and down, Connected to said armature bar is a barred needle grouping that pushes ink into the skin. Tattoo artists generally use the term “machine”, or even “iron”, to refer to their equipment. The word “gun” is often used but is looked down upon by professional artists. The predecessor to the tattoo machine was the electric pen invented by Thomas Alva Edison and patented under the title Stencil-Pens in Newark, New Jersey, United States in 1876. It was originally intended to be used as a duplicating device, but in 1891, Samuel O’Reilly discovered that Edison’s machine could be modified and used to introduce ink into the skin, and later patented a tube and needle system to provide an ink reservoir. Most modern tattoo machines can control needle depth, speed, and force of application, which has allowed tattooing to become a very precise art form. Such advancements in precision have also produced a style of facial tattooing that has attained mainstream popularity in America called dermapigmentation, or “permanent cosmetics”. The basis of the modern tattoo machine is still relatively unchanged from the 1820 discovery by a Danish inventor Hans Christian Oersted called electromagnetism (Brian & Cohen 2007). Oersted’s invention is now known, in what is commonly implemented as a prime motor for the doorbell circuit, as the basis for all modern coil tattoo systems. Modern tattoo is symbolized by the advent of the mechanized version of the emplacement of some form of ink or dye under the skin. The basic usage was first transposed from an invention patented in 1876 by Thomas Edison (U.S. Patent 196,747). Edison’s machine was not intended for the skin, but for creating embroidery patterns by means of an electric punch. This concept was further elaborated on in 1891 by Samuel O’Reilly, who took a modified version of Edison’s now dual coiled mechanism and deemed it proper for skin tattooing (U.S. Patent 196,747). 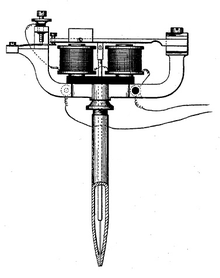 It is argued that O’Reilly was the inventor, even though it is actually Charlie Wagner who holds the 1904 patent for the “tattoo machine” (www.tattooarchive.com). This patent demonstrates that the “tattoo device” has an ink chamber or “tube” and uses the single coil method for movement of the armature bar. In 1929 Percy Waters received his patent for the dual coil tattoo machine, which was set in a frame (U.S. Patent 1724812). Another patent was issued in 1979 to Carol Nightengale, who made some substantial modifications to the frame (U.S. Patent #4159659). Some of Nightengale’s modifications can be seen today in cutback machines, and fully adjustable frame styles. Nightengale’s version was also the first patented design that utilized front and rear spring apertures. While the history of the modern machine appears just as obscure as that of the history of the ancient process of tattoo, it is obvious that there were many individuals working toward the same concept. Even today there are many innovations such as the “swash drive” or bearing driven rotary machine, the “neuma” which is run off air compression and cuts the coils and electromagnetism completely out of the machine, and the contactless machines which avoid the use of spark and utilize vibration to move the armature bars. Advances in coils from 6 to 16 wraps are also available. Tattoo machines have evolved in many ways, but the primary goal has remained the same over the ages; to put ink into the skin. The speed and accuracy that this is achieved has evolved over time, and the inks and pigments used have also changed. There are many exciting things being developed and with the information age of the Internet being upon us currently, the knowledge of machine builders and the number of tools available to tattoo artists around the world is expanding at an exponential speed. Even with all these advancements in the tattoo world, it is not uncommon to still see tattoo rituals performed in places like Japan and American Samoa the same way that they have been done for centuries. • Rotary tattoo machine: A rotary tattoo machine, built in 1978 by Manfred Kohrs of Germany. Rotary tattoo machines were the original machines, based on rotary technology, which was invented by Samuel O’Reilly and improved by the tattoo artists through the years. Rotary type machines use an electric motor to drive the needles. Some recent upgrades include using an armature bar to increase efficiency, a characteristic of coil machines. Recently, there have been improvements to make this type of machine pneumatic, in place of the electric motor used now.There are many types of machines. Liners and shaders are the more common machines from a technical standpoint. Mechanically, there are coil tattoo machines; also pneumatic machines, and rotary, or linear, tattoo machines. • Coil tattoo machine: Coil tattoo machines are the most commonly seen and used. These machines use an electromagnetic circuit to move the needle grouping. There are many variations, from single-coiled machines to triple-coiled machines. They can be made from many different materials and in many different sizes and shapes. Dual-coiled machines are considered to be standard. The coils generally range from 8 to 10 wrap. The coils create the ohms,or resistance, used to properly regulate the machines speed and power. Causing less trauma to the skin. • Liner tattoo machine: The purpose of a liner machine is to lay the ink in the skin in one single pass to create a dominant line. It uses a short contact circuit (about 1.5mm–2mm), which causes the machine to cycle faster. 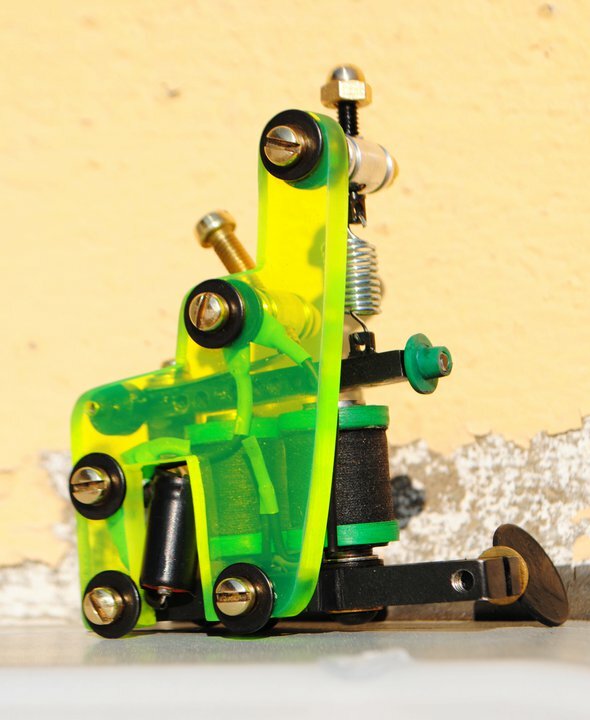 • Shader tattoo machine: The shader machine is commonly used to shade black or variants of black ink. Also Color is used in this type of machine, the saturation level of this machine is low. It uses a bigger contact gap than a liner (about 2mm–3.5mm) to make it cycle slightly slower. This machine is also used for sculpting lines. Some artists will use this type of machine for all lines, as it allows the lines to be retraced with less trauma to the skin. • Pneumatic tattoo machine: Tattoo artist Carson Hill in the year 2000 invented the first pneumatic tattoo machine and began the patent process. A pneumatic tattoo machine is powered by an air compressor, and they are extremely lightweight. Pneumatic tattoo machines use pressurized air to power the tattoo machine and drive the needles up and down. These tattoo machines are entirely autoclavable, so that the entire tattoo machine can be placed in the autoclave and sterilized fully without any major disassembly. Unlike traditional coil machines, which require complete disassembely to be placed into an autoclave. Tattoo machines are not limited to just these types. A common variant is having a “cutback”, which uses stiffer front springs. This is more commonly used in liners, but is known to be used on shader machines, more typically for portrait work. Machines are usually categorized into long stroke and short stroke varieties. The longer-stroked machines are good for coloring and shading, as well as sculpting lines, while doing less damage to clients’ skin. Shorter-stroke machines are commonly used for lining in a single pass style, and also in a shader setup to achieve a more subtle gradation of black such as would be found in portraits. Length, width, tension, angle, and stiffness of the spring varies the functionality of the machine. The contact gaps, as well as capacitor’s and even the style of machine and its angles of deflection, can also all be variants in machine tuning. The proper tuning of the machine is essential for the type of machine being used, also for the type of tattoo the artist is doing.